Mondo Fruitcake: Lookee what's coming! 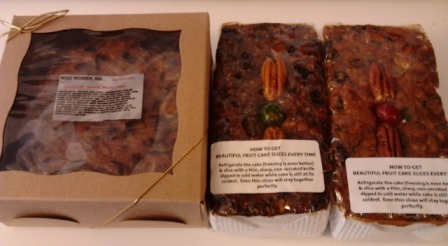 That's the Women Helping Other Women Cranberry Orange Walnut cake on the left, and the Sunnyland Farms dark and light fruitcake combo on the right. It is truly the gladsome fruitcake season! That which is unattainable is highly prized. Dag nab it. Ordered the wrong cake.